I'd like to call this meeting to order, please. Colleagues, please take your seats. We have an enormous amount of work to go through here. The sooner we get started, the sooner we end. Right now, there is no end date on this. Let's hope we can get it done before Parliament dissolves. We welcome, from the Department of Public Safety and Emergency Preparedness, John Davies, director general. From the Canadian Security Intelligence Service, we have Cherie Henderson. From the Communications Security Establishment, we have Scott Millar, and from the Department of Justice, Douglas Breithaupt. We also have Ms. Beecher, who is with Mr. Davies. We also have officials in the room available to the committee. Feel free to step up as you feel the need to. We have with us super clerks and super analysts who will move us through this agenda. Pursuant to the standing order, consideration of clause 1, which is the short title, and the preamble are postponed. The chair calls clause 2, and amendment Liberal-1, moved by Mr. Spengemann. Chair, thank you very much. I'd like to welcome everybody to the discussion. The first set of, I believe, four Liberal amendments deals essentially with the application of the Public Service Employment Act. This first Liberal amendment removes a reference to section 48 from the definition of the term “department”. It is a purely technical amendment. A later amendment will be proposed to remove the entire section 48, therefore making the reference here unnecessary. Section 48 provides the employees of the review agency with the right to move to and from other departments. The next set of Liberal amendments, as I mentioned, will cover that as well. It deals with employee mobility. The change that is being made here is purely to resolve incompatibilities between section 48 and the Public Service Employment Act, which governs most other government departments. The Chair: Next is NDP-1. I've been given a note on the chair's ruling. This amendment aims to increase the number of members from the review agency from six to eight. Therefore, it's inadmissible as it infringes on the financial prerogative of the crown and requires royal recommendation. The same ruling applies to PV-1. Matthew, could you move your amendment so I can rule it out of order? The amendment seeks to allow the body to review in a more robust capacity by establishing the membership more clearly and is so moved. Madam May, welcome to the committee. I'd like to put on record my habitual objection to the process that this committee and every other committee adopted of forcing me to come to committee with amendments, rather than enjoying the rights I would have otherwise to present such amendments at report stage, because of the peculiarities of the motion that was originally drafted by the Harper PMO. Strangely, the same wording was applied in the next Parliament by the new PMO. In any case, my motion has been deemed moved before I got here because I don't have any powers on this committee other than to appear with my amendments per your request. Given that the intelligence commissioner is the first real-time overseer and not just the reviewer of national security in this country, I believe it is important that the position be filled much like the Auditor General's with a vote in Parliament and not just on the recommendation of the Governor in Council and the Prime Minister. I will make note of a ruling with respect to CPC-1. If NDP-2 is adopted, CPC-1 cannot be moved. A requirement that both houses of Parliament approve appointments to the NSIRA is not necessary and is inconsistent with established practice. We suggest members vote against this. The Chair: If NDP-2 is defeated, so also is CPC-1. Next is CPC-2 and Mr. Motz. This amendment requires more detail and specific background for members of the review agency when they are being considered for membership. Common sense requires individuals with national security backgrounds to sit on the review agency, the same agency that reviews national security matters. It's quite a lengthy and complex system that is set up by this proposal, but perhaps the part that concerns me the most is the fact that it would involve senior intelligence officials in selecting members of the review committee. It creates a conflict as the individuals who are participating in the selection are the very people who are going to be reviewed by this organization. I actually am very concerned by this proposal and I oppose it. The Chair: On CPC-3, we have Mr. Paul-Hus. What I'm reading right now seems to indicate that the position of vice-chair is optional, but it is unclear. We recommend that this vagueness be dispelled and the position of vice-chair be clearly mandatory, as that is important. If we have misinterpreted that aspect, I invite the officials in attendance to explain the situation a bit better to us. It's an interesting suggestion, but it really takes away the flexibility for NSIRA to manage its own affairs. Ultimately, it might not always be necessary to have a vice-chair. It may not be a necessary part. That would be my objection. I support this amendment because the bill does seem to prevent the appointment of a vice-chair and allow the chair to appoint their alternate as needed, instead of a vice-chair automatically taking the chair in the chair's absence. I think the vice-chair should be appointed when the review agency is created, instead of waiting for each of the chair's absences. I would like to have expert opinions on that issue. Who were you directing that to? My question is for the person in charge of the file. On page five of the act, proposed subsection 5(1), there is a process for an acting chair, the vice-chair. There's no vice-chair formally appointed. There already is a section in the act to cover that. You are talking about subsection 5(1), which pertains to the acting chair, correct? In proposed subsection 5(1), if the chair is not able, or if there is no vice-chair, there is a process to nominate an acting chair. Okay. But I want to make sure that I have the correct provision in front of me. It's page five, proposed subsection 5(1), acting chair. 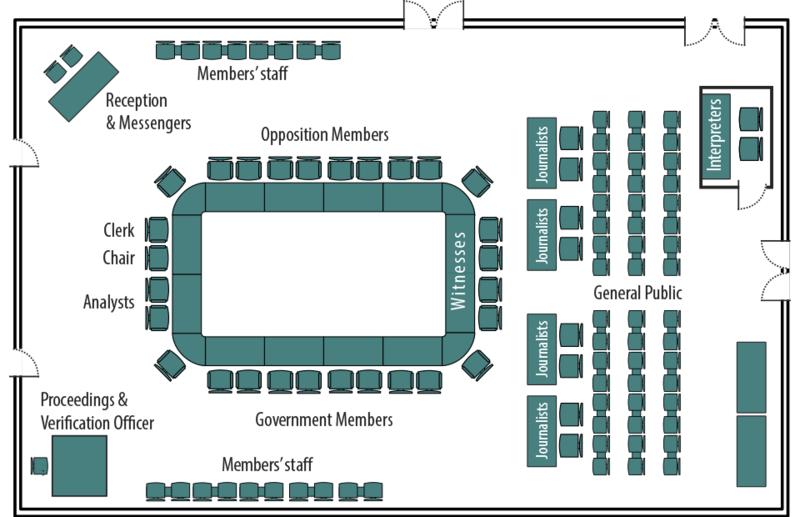 Would it not be reasonable for an organization of this importance and this size to have a standing vice-chair? In my view, it would be most appropriate that an organization like this would want that position and not wait for a case when there isn't a chair, so that they'd have to go through the process of finding a vice-chair. Certainly, they may want a vice-chair. I guess the difference here is that this is a review body, where the governing structure really flows from the executive director and from the staff of the executive director. This is a board that's going to meet infrequently, so the need for a running vice-chair may not be there. It may be. It depends on how they want to run it. It's not something you would necessarily need. That's why there is the potential need to preserve flexibility. Are there any further interventions? Our amendment concerns line 4 on page 5, where it says “may designate”. I understand that other designation cases are covered in subsections 4(7) and 5(1), but on line 4, it rather says “may designate”. We want the wording to be “designate” instead. The expression “may designate” indicates a possibility, and we are proposing that it be made into an obligation. The NDP agreed with that. Perhaps it's more a discussion with the drafters about “may” versus “peut”. I understand them to be synonyms, but I would want to have the jurilinguists look at that. It was intended to be “may” on the French side. It's the view of the legislative clerk that there is not a drafting issue here. It says what it says and it's clear what it says. Therefore, the amendment before the committee is clear. I was curious about the drafting piece. I stick to the same thing. It's not that the organization cannot have a vice-chair. It may have a vice-chair. It's a matter of providing that flexibility, rather than a rigid rule. To me, it makes sense the way that it is currently set out. From the experts, are there organizations of this size and importance already in government that have wording like this and that don't include a vice-chair as normal practice? I'm not familiar with another organization that would require a vice-chair, in law. Next, we have Mr. Motz on CPC-4. This requires that the chair be a full-time member. The rationale is that currently the chair is to work on a part-time basis, yet at his or her salary level, that is unacceptable. The amount of work that this agency will conduct will likely require a full-time attitude and effort. Again, there's a similar thread that's carrying across, which is the matter of allowing for flexibility within it. The wording, as it is, allows for a full-time position. It's something that could happen, but having the stringent requirement that it must be a full-time position takes away flexibility. It takes away the possibility for some suitable candidates. Having worked as a lawyer in Toronto, I know that there were a lot of qualified people who would do part-time positions because of different things. I worked part time. There were job shares and all sorts of flexibility, which in fact increased your opportunity to have suitable candidates. I would keep the flexibility there. You can have a full-time person or it would allow for a part-time position. I appreciate the point that was just made, but I think having these positions be part-time or even having the possibility of their being part-time shows a lack of seriousness with regard to the review process and wanting to undertake it properly. I find it difficult to imagine that someone on this kind of body would be involved with other work or doing other things or only part-time. If we really want to take seriously the kind of accountability that's being sought with the agency, then I think it should not be a part-time position. Therefore, I support the amendment. We're talking about national security here. This is national security. This is why we've been given this for second reading. This is a serious issue, as Mr. Dubé has said, and you don't work on this off the corner of your desk. I believe it's critical that this individual's mind be engaged in this on a full-time basis. His attitude and his effort need to be full-time. I don't think it can be anything but that. So it is the same thing. The Chair: We'll move on to CPC-5. It's the same amendment as CPC-4. Has that one been tabled, because it is following what the other amendment said? CPC-4 was defeated; therefore, CPC-5 is now up. Is there any debate on CPC-5? The Chair: On CPC-6, we have Mr. Motz. This amendment indicates that really no member designated as the chair can hold the position for more than 30 days. Bill C-59 allows a member to hold the role of chair for 90 days. That's far too long, and a vice-chair should be in place to cover off all the absences of a chair in the first place, so that's the rationale behind this particular amendment. Thirty days is a very short period of time; 90 days is a reasonable amount of time for someone to hold the position. It would just add to an administrative burden to limit the time. It, again, reduces flexibility. Ninety days isn't a very long period of time, either, so I would suggest that the way it's worded right now is fine. —because it's already been defeated, the chair isn't around to assist in selecting a vice-chair, so to me it's reasonable in these circumstances to have a chair fill the position for a shorter time period. I want to clarify that there may be a vice-chair. That is still within the legislation. Can the officials tell us if we can appoint the vice-chair inside the 30-day window? That's impossible to answer given that this depends.... It's a GIC prerogative to do that and normally it would take more than 30 days. Especially on national security, we may need to vet the person and so on. Just to be clear, proposed subsection 5(1) is the process for the acting chair. If there is no chair and no vice-chair, the process is there to appoint an acting chair, and then there's 90 days for the Governor in Council to appoint a chair. So you have three months to find a chair if, for whatever reason, the chair or vice-chair is not there. The Chair: Now we have Ms. Damoff on LIB-2. We've heard from the Canadian Bar Association concerns about the ambiguity of the language surrounding the NSIRA's mandate and whether it's overly broad. This amendment clarifies that the NSIRA has full authority to determine its own procedures. It also removes any ambiguity about the scope of authority of the NSIRA to avoid a possible dispute with other departments. Harmony is breaking out here. My goodness, the motion passed unanimously. We now go to NDP-3. This amendment is very long but relatively simple. A comment was made very often during our study of the bill. As you know, the Canada Border Services Agency can receive complaints about the conduct of certain agencies or departments. However, Global Affairs Canada is not covered by the complaint mechanism, which is a very serious omission. This is a very important element, especially when it comes to consular services. We know, as it was shown in Maher Arar's case, that the sharing of information done by that department can lead to violations of Canadians' human rights, especially abroad. This amendment would enable the agency to receive complaints related to Global Affairs Canada's conduct. The second point concerns the Canada Border Services Agency. As you also know, an opportunity to create an organization that would oversee the agency's activities was missed under this bill. That organization still does not exist. The minister showed openness, but we are anxious to see something concrete. In addition, it would be appropriate for the oversight organization, in a context of national security, to be able to receive the complaints related to the Border Services Agency's conduct in the meantime. In closing, I would say that this amendment really just adds to the complaints provisions in the legislation. It's nothing earth-shattering but it ensures that we have a robust process for all agencies and ministries that might be involved in different situations that can become problematic with regard to Canadians' rights. While we would agree in principle on the intent of the amendment we heard that only a small part of Global Affairs' and CBSA's work actually focuses on national security and intelligence. This bill as drafted would deal with the national security and intelligence portion of it. If there's a desire to have oversight of Global Affairs and CBSA, the public would be best served by having complaint mechanisms put in that are tailored to their unique mandates. As it is now, the NSIRA will be focused on a small part of what they're doing. In fact, we heard testimony that it would actually slow things down for people who were complaining about things that fell outside the mandate. Therefore, we won't be supporting it as written. Like Ms. Damoff, I don't understand in what way the NDP amendment concerns national security. In fact, I am unsure of whether there is a link between the proposed amendment to the bill and national security. Officials could probably share their opinions on this, as well. Mr. Davies, do you want to respond to Mr. Paul-Hus? Maybe I'm not following your question. My understanding of the amendment is that it's for a complaints function particularly with Global Affairs and CBSA. The minister has made the point a few times that the CBSA review mechanism, including complaints, functions on a separate track and separate legislation is being worked on in that regard. NSIRA is only dealing with national security review and complaints regarding CSIS and the RCMP. If you look at the legislation, in proposed section 8, it specifically mentions certain aspects: reports made to the agency under the Citizenship Act, matters referred to the agency under section 45 of the Human Rights Act, complaints under the RCMP Act, and any complaint made under proposed subsections 16(1), 17(1), or 18(3). What we're seeing here is, despite the fact that the majority of witnesses who did raise this point spoke in favour of what this amendment is putting forward.... Despite it being a small portion of Global Affairs, as is being advanced, this is something that goes to the heart of what was talked about, most notably in the Arar inquiry, because Global Affairs does play a role in how these situations play out. Moreover, CBSA, as far as I'm concerned, acts exclusively with regard to national security. I see no other way to define what goes on at the border than to say that it's related to national security. I think, in the meantime, there's a huge gap there. There's no accountability for CBSA, so to have this complaint mechanism in the mandate of the agency and not expand it, as many witnesses asked us to, is quite disappointing. Once again, this just shows how the accountability and the review that we're seeking is not being taken as seriously as the government pretends. I'm wondering if Mr. Davies could clarify that anything that happens with CBSA and Global Affairs that does have to do with national security, such as what happened with Arar, would be covered under this legislation. With this amendment proposed, I'm wondering whether there is the need to add additional staff to accomplish this—and would there be additional costs, obviously, with that—and whether Global Affairs and CBSA have those resources in place already. It would be impossible to predict. The national security mandate for Global Affairs and CBSA has already been set. It's probably small, so the number of complaints would probably be small, but there would likely be resources needed, at least to sort of pressurize the system to receive complaints if that mandate was added on. For the record, I want to say that the RCMP is also covered by the review agency, yet that hasn't prevented the legislation from including a complaint mechanism with regard to the RCMP. I think it's important to distinguish between the agency's ability to review these agencies and the ability of a Canadian whose rights have been impugned to make a complaint to the review agency. I think it's an important distinction, and once again, I fall on the witness testimony. Many witnesses did bring this up as a large gap. More specifically, with regard to CBSA, as of now, NSIRA is the only body that has any review of CBSA. CBSA, unlike other agencies that are involved very closely with national security, has no specific review entity associated with it. Moreover, I would just add, in light of some of the situations we see at the border, giving Canadians some kind of mechanism so that they can make these types of complaints to a body like this is absolutely appropriate. The last point I would make, goes back to an earlier point that was made and also alluded to by Mr. Motz about staff and so forth. The amendment does make clear, as should be enshrined in the law, that the agency will not deal with complaints unless they are deemed to be not trivial, vexatious in nature, or made in bad faith. Once again, it's a gap that is there. I see no reason why this can't be supported, other than the fact that we don't take the accountability that we claim to want to bring forward seriously. Is it possible, given that we haven't heard from Global Affairs and CBSA, to have them here? Can we just table this for the moment and bring them here to the committee to answer specifically to this particular amendment? I think we would have to deal with it as a motion first. We would table it and then, in effect, postpone the date, which I would think takes precedence over this. Is there any appetite? If you move the motion, we could debate that motion, then vote on the motion and move from there. Just before I get too far down that path, I want to check with the people who actually know what they are talking about. Mr. Motz, your motion has actually been ruled out of order. We cannot move that at this time. Is there a reason for that? Is it because we already have a similar one? It may have been ruled out of order because we have already started to deal with the clause. My theorizing would be that you would have had to move that motion at the beginning, before we started to deal with this clause. Is that somewhat correct? You are able to move a motion that postpones consideration of the entire clause but not of this section alone. Interesting, I learned something today. Are you moving your motion, or are you withdrawing your motion? Obviously it's inadmissible so I withdraw my motion. The motion is withdrawn, so we're back to the amendment. Is there further debate on the amendment? I saw Mr. Picard waving his hand. As Mr. Motz said earlier, this is a matter of national security, as confirmed by experts. The legislator's intention with this bill is to focus exclusively on national security. However, customs' responsibility goes well beyond national security, especially because of the commercial nature of the agency's activities. It would be unrealistic for the review agency to also be in charge of all the complaints related to customs, as that has absolutely nothing to do with its mandate. The Chair: We are on LIB-3. Again, I'm going to mention some testimony that supports this amendment. We heard from Micheal Vonn who said that national security activities in general are plagued with the problem of having words in a statute or directive interpreted in sometimes obscure or deeply troubling ways that may not be unearthed for years. This amendment requires the national security and intelligence review agency to review and report on new and modified ministerial directions. It also strengthens departmental accountability by requiring the NSIRA to review how departments implement ministerial directions. I support the amendment. I think it's a good idea. I do want, however, to point out that it's interesting that we propose amendments on the Liberal side to increase the mandate and vote down amendments that would make the chair full time. That is exactly what I was thinking. Thank you, Mr. Dubé. It's nice to know that Mr. Paul-Hus and Mr. Dubé think exactly alike. To clarify, we didn't vote down an amendment to make it full-time. It can still be a full-time position. It's optional. We're not saying it won't be full-time. Is there other debate on LIB-3? The Chair: On CPC-7, we have Mr. Motz. Thank you, Chair. This particular amendment requires the minister to table for Parliament a clear outline of how these organizations work together—the NSIRA, the CSE, CSIS, and the new parliamentary committee—and the powers, duties, and functions of the minister. It's intended to address the committee's confusion on the bill and how all these organizations work together. That's the motivation behind this. We heard repeatedly throughout testimony on Bill C-59 that how the government will structure the new parliamentary committee and the NSIRA remains unclear. We still don't have a clear idea of how they will work together. That hasn't been clarified yet. Therefore, we should have the minister provide that clarity as soon as possible. Perhaps the officials can provide us some clarity on that today, if possible, in terms of how these bodies will work together. In my view this amendment isn't necessary, because under Bill C-59 the NSIRA expert staff already have the authority to obtain ministers' national security intelligence responsibilities or information. Why place an additional formal burden on the ministers? Equally, the NSIRA would already have the authority to publish general background information in its annual and special reports. My submission to the committee is that this amendment is not in fact required. I understand what my colleague is saying, but, like Mr. Motz just mentioned, a number of witnesses have told us that they had doubts about the effectiveness of the relations. Our goal was to include an element that would clarify the minister's mandate. Even Richard Fadden and other witnesses told us that a problem existed. I don't know how people from the public service see this, but based on the testimony we have heard, we felt that it should be added to the legislation. Mr. Davies, do you want to respond? I would just say, as was already said, that the mandate of the review body already allows it to ask for whatever it wants from any department or agency, whenever it wants. Presumably you'd already be staffed by experts who are very much familiar with the mandates and so on. There are already many annual corporate reports and annual reports, and so on, published by the agencies, and things on websites and so on, that explain the powers and duties of these agencies. It's not clear what else you would get. Maybe this is how we're reading how these words are drafted, but it's not clear what additional information you'd get from this amendment. The Chair: On CPC-8, we have Mr. Motz. Thank you, Chair. This requires that the review agency, NSIRA, take all steps possible to avoid the duplication of work. It will cut down on duplication, obviously, and make the groups more effective in the long run. The amendment seeks to have NSIRA and part of the committee coordinate their work to limit the amount of red tape and extra work provided to the agencies such as CSIS and CSE to ensure that the massive costs are reduced at least a bit and to make the administrative burden that of these new groups. Parliament needs to know this issue, and I think it's a reasonable ask, a reasonable amendment. If I can direct the committee's attention to clause 49 on pages 35 to 39 of the bill, in my view there are provisions in that clause that are very similar, if not identical, to what's being proposed. Clause 49 does a couple of things. It requires NSIRA and NSICOP to co-operate to avoid unnecessary duplication. It also gives these two bodies explicit authority to exchange a range of classified information that's related to their reviews. My submission to our colleagues is that we do not actually need this amendment. I'd like to hear from the officials about that, Mr. Chair. The spirit is there, as was mentioned. The ability for them to co-operate is already contained in clause 49. The other concern with the drafting of this amendment is that it does not allow the exchange of classified information. It does not remove the ability to exchange complaint information, which you would not necessarily want to do in this case. There are two concerns there. Is there any other debate on CPC-8? The Chair: We're on NDP-4. The amendment seeks to ensure that the agency could obtain the foreign intelligence used by bodies like CSE on which that organization relies to take actions related to national security. Right now, it has access to any documents a department may have in its possession. I am sure it could be argued that foreign intelligence could be included in this definition, but the objective of my amendment is to ensure that it will be as clear as possible, especially since CSIS and CSE often act based on intelligence obtained by allies or other countries. This amendment is complementary and adds clarity. It seems this amendment isn't necessary, and maybe officials could clarify this for us. Foreign intelligence services already can make a disclosure to the NSIRA, and it's probably unlikely that they would. They would likely go through our security agencies. It seems that it's redundant to add it to the legislation when the ability is already there. The NSIRA could request that information anyway. Yes, you are correct. We do not believe you need legislative authority for the NSIRA to receive classified information from a foreign intelligence agency should that agency want to give the NSIRA that information. Normally the NSIRA would get it directly from any of the Canadian departments and agencies. They have full access to it. Anything the agencies have, other than cabinet confidences, the NSIRA can get. I anticipated that argument, and that's why, as I said, and I'll repeat, I believe greater clarity is always better when it comes to a body that is being put in place to protect Canadians' rights. Is there further debate on NDP-4? The Chair: We're now on LIB-4 with Mr. Fragiskatos. This amendment would clarify that, when conducting reviews, the NSIRA has access to all information except cabinet confidences. That would include information that is subject to common law privileges under the law of evidence, such as police and former privilege. The intent was always for the agency to access this information, but making it more explicit removes any potential for disputes should they arise in the future. Finally, Bill C-58 makes explicit reference to privileges under the law of evidence and it raises the possibility that the absence of such language from this bill, Bill C-59, could be interpreted as suggesting a lack of access. As such, the need to make the review agency's access clear is here with this amendment. Is there any debate? I see none. Wait a minute, Mr. Chair. I need clarifications. You will see that amendments CPC-9 and CPC-10 are saying something very similar. So I would like Mr. Davies to give me clarifications on the government's position and to compare it with ours. We were adding a small nuance regarding the ministerial cabinet's documents. Can you explain to us the argument that was just made, but from a more technical perspective? The idea with this amendment is to replicate exactly what was already in the CSIS Act in terms of access to information covered under common law privilege. When Bill C-59 was drafted, this was just an oversight of the CSIS Act. We didn't want any confusion that there would be any lack of or any differential access for review that SIRC, the Security Intelligence Review Committee enjoyed. All we're doing is fixing an error in drafting when Bill C-59 was created. I think this issue was raised in other amendments coming up, and it was raised during committee hearings a number of times. It looked like there was less access and that was not the intent. Is it possible for you to comment on the differences between this amendment, LIB-4, and amendments CPC-9 and CPC-10, which we have coming up? I know we haven't got to them yet, but the implications.... Before we vote on this one, what are the differences? Is this going to have implications for CPC-9 and CPC-10, which are coming up? It's just drafting language in terms of CPC.... I don't know if we want to jump ahead to CPC-9, but the words “or” and “but” are used, and in CPC-10, it's “and”, versus LIB-4. It's crystal clear that the information is subject to any privilege on the law of evidence. It's just drafting differences. With respect to CPC-9 and CPC-10, I think the real similarity lies with LIB-5, which I'll be speaking to in a few minutes. The Chair: On CPC-9, we have Mr. Paul-Hus. This is what we just talked about. This amendment is similar to amendment LIB-4. We wanted to get explanations to ensure that the difference—We just voted on LIB-4, but is the impact on amendment CPC-9 negative, positive or none? It is technical. What we are proposing in amendments CPC-9 and CPC-10 is proposed in amendment LIB-4. We want you to tell us whether, from a technical stand point, these amendments are no longer necessary or should still be debated. I am not sure whether I am explaining clearly. Mr. Pierre Paul-Hus: Okay. We just voted on LIB-4. We feel that CPC-9 is similar to LIB-4. We just want to check whether that is indeed the case. Should we vote on it or get rid of it, since we have already voted on LIB-4? As was mentioned, CPC-9 and CPC-10 are accessing common law privilege for the complaints function, which is picked up in LIB-5. In terms of apples to apples, they're both talking about the same thing. It goes back to what we think is just clearer drafting language in LIB-5. “Despite any other Act of Parliament and any privilege under the law of evidence and subject to” is clearer than CPC-9 and CPC-10, where you're using “and”, “or”, and “but”. Are CPC-10 and LIB-5 not exactly the same? CPC-10 is “Despite any other Act of Parliament or any privilege” versus Liberal-5 “Despite any other Act of Parliament and”. Just to clarify, am I right that CPC-9 and CPC-10 are in fact textually identical? Oh no, there's a “but” in there. Never mind. One's a “but”; one's an “and”. Okay. We're at Madam Damoff. These three amendments are very similar. I'm just wondering if the officials could say what's the best wording on this because we're talking about “and”, “or”, and “but” being the only difference between them. Which is going to capture what we all want? We all have the same intent. Mr. Davies, I believe, already commented on that. We believe LIB-5 captures the intent. Is there any further debate on CPC-9? Are you wanting to debate or wanting to vote? From a legal perspective, from our experts in the room, is there a difference between “and”, “or”, and “but”? Seriously, I think we all have the same intent, so we need to determine what language we want to use that has the same intent. Who wants to answer that question? I don't particularly, but I think that our drafters would probably tell you that “and” is comprehensive, so both elements are included in the sentence. “Or” maybe just parses it out, says this or that. Honestly, I think either way you would achieve the intent, but our drafters tell us that technically an “and” is more appropriate than an “or” in such a statement. Do we have clarification there, Mr. Motz? The Chair: Turning to CPC-10, again, it's Mr. Motz. It's the same as we've been discussing in LIB-4. You were satisfied with the clarification before. You're satisfied with the clarification now. The Chair: Moving to LIB-5, we'll go to Mr. Fragiskatos. I think we know what the intent is, but I can justify it if you like, since there are so many similarities with CPC-9 and CPC-10. I'm in the hands of the committee. Do you wish to speak to it? Just introduce it, at least. Sure. The amendment clarifies that, when investigating complaints, the review agency has access to information that is subject to common law privileges under the law of evidence not otherwise named, such as police informer privilege. The intent was always for the review agency, again, to access this class of information, but making this explicit removes any ambiguity. Finally, Bill C-58 makes explicit reference to privileges under the law of evidence. This raised the possibility that the absence of such language from Bill C-59 could be interpreted as suggesting a lack of access. This avoids that risk by making the review agency's access clear in legislation. I have an issue with the translation. Amendment CPC-9, which you just defeated, is identical in French to the French version of amendment LIB-5. Since the committee has voted against amendment CPC-9, it would be logical for everyone to vote against amendment LIB-5. What is done when this kind of an issue arises? The two French versions are exactly the same. You just said “opposed”. Does that mean everyone is voting against the amendment? Amendment LIB-5 must be defeated because amendment CPC-9, which is identical, was also defeated. That said, the wording is not the same in English. I just received French lesson 101, and I'm going to let our legislative clerk explain why the problem that you've identified is not a problem. You are right to say that the French versions are identical, but sometimes the English version, unlike the French version, requires more clarifications in terms of deciding whether to use “and” or “or”. Sometimes, the French version is clear de facto. In this case, the “et” includes “et” and “ou”. That is why it is not necessary to use both words in every case. In the English version, it says “or any privilege”, but the French version says, “et toute immunité reconnue par le droit de la preuve”. I don't see the distinction you are making. In my opinion, the meaning is different. It would not have said, “malgré toute autre loi fédérale ou toute immunité reconnue par le droit de la preuve”. If we decide to adopt amendment CPC-9, the translation must be accurate. I cannot discuss the translation, as I am not a translator, but specialized translators would be able to do so. I assume that the translators who worked on the amendments had the amendments of the Conservative Party, the NDP and possibly the Liberal Party at the same time. At the end of the day, “and” and “or” are translated in the same way. If you look at the federal body of legislation, sometimes “and” and “or” are translated in the same way in French. Mr. Chair, I appreciate the point that has been made. As someone who's bilingual, I try to go through both versions. It's not always possible because it can be a time-consuming thing. I'm okay to be corrected on the difference being different in French, but the fact is that the wording is exactly identical. Procedurally, an identical wording would mean that the follow-up one would be amended. I'm wondering, in terms of our privilege, especially for French-speaking members, how that plays in and if that means that LIB-5 is even in order. I agree. I am not currently reading the English version; I am reading only the French version. I was forced to vote against one of my proposals, and the wording of amendment LIB-5 is identical to the wording of amendment CPC-9. The English translation changed the words. I agree that the subtleties of the English language are different from those of the French language. However, I must vote on an amendment today. In French, the two amendments are identical. So I think that amendment LIB-5 should be defeated, just like amendment CPC-9 was defeated. I have a question for the clerk. “de la preuve et sous réserve de la”? Could we change “mais” to “et”? Voices: It says “et” now. Ms. Pam Damoff: Not in LIB-5, it says “mais”. Ms. Pam Damoff: Not in the one I'm looking at. Everyone has the same. They're different in English, but in French they're exactly the same. Right. In the French version of LIB-5, in the very last line where it says, “mais sous réserve”, it should be “et sous réserve”, right? But this is wrong here. I think we're crawling towards a solution here. Mr. Paul-Hus, and then we'll ask our clerk to comment. Mr. Chair, I will provide a very simple explanation. In the Conservative Party's amendment CPC-9, it was “mais” in French and “but” in English. In amendment CPC-10, it was “and” in English and “et” in French. Finally, in amendment LIB-5, it is “but” in English and “et” in French. In the LIB-5, if we decide that “but” is the right one or “et” is the right one, you have to vote for the Conservative one, depending on which one you want. I ask for a five-minute break so we could discuss the nuance of gray on this one and agree on one version. The idea of the legislator is there; it's just the word. With the help of the expert, we'll manage to find the proper wording for something that seems to be the exact same thing. You can't go backwards, though. I'm prepared to suspend for a couple of minutes to see if we can sort this out. I can have Mr. Motz weigh in here. Obviously, I'm not a bilingual expert, but I'm curious to know from those officials who are here whether they encountered anything similar in legislation where we would have this disparity between “and”, “but” , or “or”. Maybe now they could weigh in on our suspension. Okay. I'm happy to do that. I think the suggestion that we work this out off-line for a couple of minutes is a good one. First of all, I'll ask if you're directing it to Ms. Beecher or Mr. Davies. In my experience in legislative drafting, it does happen that the French and the English are not direct translations of one another but rather, the operative words are not the same to achieve the same effect. In the case of the “mais” as opposed to the “et”, I think we have less to say on that. It's for the committee to make a choice on that particular word. Let's suspend for a couple of minutes. Don't wander too far away. The meeting is back in order. We think we have a procedural fix and a linguistic fix. Mr. Picard will move a subamendment to the amendment. Then we'll vote on the subamendment and then the amendment. Before I propose my subamendment, I would like to make a comment. We all agreed on the importance of having an identical translation that does not lead to confusion. We all agreed that the legislator must first have an inclusive approach. I think that previous expert testimony went in that direction. So I propose a subamendment to amendment LIB-5. I propose that the English version remains as it is and that, in the French version, the word “mais” be replaced with the word “et”, so that it would correspond to the French version of amendment CPC-10, but would bring consistency and similarity of statements in English and French in amendment LIB-5. In short, the subamendment aims to change the word “mais” to “et”. and in French, it will be “et” and “et”. Is that correct? In spite of my pronunciation, people understand what has been moved? Mr. Picard has so moved. Is there any debate? I will make a quick comment, as I don't want to delay things more than necessary. I just want to respond to Mr. Picard's comments on the importance of the translation for a parliamentarian who may be working only in French. There must be consistency. I also want to say that I support the subamendment. Those in favour of the subamendment? The Chair: Again, such harmony. That deals with amendment LIB-5. We are now on LIB-6 and that would be Ms. Damoff. Just before I start, I want to say to my colleague, Mr. Paul-Hus, good catch on that one. Thank you. On this amendment, it is something that, certainly, I feel very strongly about. We've heard a lot of testimony about the need for the ability to coordinate the review agencies involving the Privacy Commissioner. However, I do believe that Ms. Dabrusin's amendment, LIB-7, is better written than mine, so can I withdraw my amendment? You are the mover of the amendment. Therefore, you can withdraw it. I will withdraw mine to support LIB-7. Okay. We don't need any debate or vote. On LIB-7, we have Ms. Dabrusin. As Ms. Damoff started, this amendment goes to coordinating reviews with the Office of the Privacy Commissioner. It would prevent an unnecessary duplication of work, but also, even though the Office of the Privacy Commissioner isn't a national security review body, it does, sometimes, have some things that would cover the same ground as the review agency, so this allows for that coordination. I would propose that we support LIB-7. I tentatively support it. I just have a few questions. I don't know if Ms. Dabrusin can answer or perhaps the officials could, but it was mentioned that the Privacy Commissioner's mandate is different and perhaps larger in the sense that it's not only about national security. It's about some of these things where there's overlap and such, and the fact that the findings of the commissioner and the review agency may be different. I'm just wondering if by putting in place a legal framework to avoid duplication we also potentially push out conflicting but necessary reports and findings from the two bodies while respecting the spirit. As Ms. Damoff said, it is something we heard a lot of concern about. I just want to make sure we're not hamstringing one body or the other in trying to achieve this objective, especially when there's overlap outside of the realm of national security with regard to the Privacy Commissioner. Are you directing your inquiry to Ms. Dabrusin or...? It's to whomever could provide the information that will help. Do you want to respond at all? I think Mr. Davies can respond. I would just say that the system doesn't prohibit duplication. It's really legislative changes to encourage co-operation ideally with the intent of avoiding duplication. You may still want to do studies on similar topics, but it's to ensure that it's not the same group going the same week to talk to the same staff. When we say to avoid any unnecessary...that's the safeguard to allow them to do the work nonetheless while pushing them in a direction of collaboration. Mr. John Davies: That's correct. Mr. Matthew Dubé: Okay, great. Thanks. Far be it for me to pit my two Liberal colleagues against each other on this amendment, but I'm curious, from the officials' perspective, in terms of the intent of what we're trying to do with the amendment, which language they believe fits better with the intent. Which one do you think is better in your opinion between LIB-6 and LIB-7? We believe that LIB-7 and LIB-12, together combined, very helpfully encourage a good two-way flow of information with the view of instilling co-operation. It allows them to share classified information to the extent necessary to avoid duplication and also takes out of the equation the complaint process so they're not tripping over each other or sharing information related to complaints given this quasi-judicial angle to the complaints process. Thank you. Is there any further debate? The Chair: We are on NDP-5. Right now, the provision requiring the Canadian Human Rights Commission to be consulted uses the wording “if appropriate”, and so my amendment seeks to have the review agency consult with the commission to outline guidelines that would codify the way in which they consult them and not have it more ad hoc with the “if appropriate” wording. It depends who you listen to. There are some who might suggest that there have been some questionable decisions by the Human Rights Commission and they've made some great ones as well. I'm wondering whether they have the expertise to deal with these sorts of issues and to make decisions with respect to what this act is about. I would submit that they would be establishing in which cases it's appropriate, so it would not be something binding and there would be for “opinion or comments under subsection (1)”. The Human Rights Commission wouldn't be having any kind of veto or whatnot. It would just codify the way in which they would be consulted by the review agency to offer that expertise, but it obviously wouldn't have the kind of consequence that Mr. Motz might be alluding to in his remarks. The reference to the commissioner speaks to the faith in his decisions. I think that the same faith can be put in the person in charge of the review agency. Their ability to judge what is appropriate or not appears sufficient and is surely just as serious as an evaluation the commissioner may make. To avoid any slowdown in the analysis of complaints, I will vote against the amendment. I think that it is unnecessary because their judgment will surely be appropriate to decide when the human rights commissioner needs to be consulted or not. If I may, before we move to the vote, I just want to say that, on the contrary, I find that doing it on an ad hoc basis, judging if it's appropriate, is what would become cumbersome, whereas I think establishing it in advance and consulting with the Canadian Human Rights Commission would allow for that process to be properly delineated as the review agency moves forward with its mandate. The Chair: Now we are on NDP-6. The point of the amendment is simply to give the review agency the power to make orders to require appropriate and legal conduct from the departments related to national security that come under their jurisdiction. That was raised in some of the briefs we have received, as well as in the testimony of certain civil liberties groups. I think it is appropriate in order to be able to require more accountability in terms of the actions taken by departments related to national security. I think it is tricky to increase the agency's powers, since, when an agency starts to intervene or potentially intervene in operations, its view of those activities, and surely the knowledge of potential consequences, may not be adequate. It can already report suspicious or illegal activities, but intervening to a larger extent would jeopardize the operations under way. So I think that the agency's capacity should be limited. I will oppose the amendment. As for Mr. Dubé's proposal, is it not more the responsibility of the minister than the agency to issue directives on that? Are you directing that question to...? My question was for Mr. Dubé, but Mr. Davies can answer it. My question is about figuring out whether that role does not belong more to the minister. Ministerial discretion to do what? I'm not following what the minister would be doing here. In terms of issuing a report to the agency, ministerial direction is essentially orders to their department or agency, so if the review body's findings conclude in a certain area, the minister could issue a ministerial direction to change internal procedure, reporting to him or her, and so on. Normally the minister would retain accountability here. I'd just like to address a few of the points that have been made. There's nothing here talking about any of the specificity that Mr. Picard alluded to about operations. Too often we hear ministers, even though our parliamentary system requires ministerial accountability, whether it's an Auditor General report or any watchdog's report, saying that they accept the recommendations. We hear that day in and day out every time reports are tabled, and so, in keeping with our tradition in the NDP of asking for some of these watchdogs like the Privacy Commissioner and others to have more teeth, I believe that the ability to make orders requires that there would be follow-up in keeping with findings that might be less than advantageous to the different agencies in the event that there would be a serious breach of Canadians' rights. I think giving the watchdog the ability to make orders to follow up on that is appropriate. They're not getting involved in the day-to-day activities; they're simply requiring compliance with laws and applicable ministerial directions. I don't think this comes into contradiction with the minister's ability to also require the same things, but as I said, I think that giving these watchdogs more teeth is better for Canadians. I guess the concern I have with how this is worded is that we have the appearance that maybe the oversight committee is actually in charge of the agencies. I'm concerned about that, because they are not. They are an oversight body. An oversight body reviews the activities of an agency for compliance. That is already in the act. However, to then make recommendations back, or “to make orders to ensure”, to me says that now we are directing that agency. I don't think that's the role of NSIRA at all. I don't think that was how it was ever intended to be. That's how I would take this, and I would certainly defer to our experts on how they might interpret that. The phrase “to make orders” definitely brings you into real time and into oversight, versus the review body's mandate set up now in the act that is looking backwards, looking at performance relative to ministerial direction and compliance with the law. The concept of orders puts you more into an oversight entity. The Chair: On LIB-8, we have Mr. Fragiskatos. This is a reasonable amendment here I think, without question. This amendment requires the new agency to suspend a complaints investigation if it determines that the investigation would interfere with “an ongoing criminal investigation or proceeding”. This sort of complaint could arise if the review agency were investigating a complaint against the RCMP. The RCMP's own independent review body, the Civilian Review and Complaints Commission for the RCMP, is currently required to suspend its investigations for the exact same reason. The goal here is to ensure that the review agency's activities don't conflict with the work of the police. Suspended complaints investigations would be resumed once the conflict was resolved. I'm leaning towards opposing this amendment. We came across this problem when we debated Bill C-22, creating the committee of parliamentarians, in terms of this notion of ongoing investigations. We can look at a situation like the Afghan detainees or Air India where those investigations could have been subject to this type of provision. Interestingly, often some of our opposition amendments are rejected by those on the other side, on the grounds that these things are built into the legislation and understood in more subjective ways. This time I will be the one deploying that argument, because I believe it's understood that these review agencies are doing after-the-fact review at any rate, which was part of the rationale for rejecting my previous amendment about making orders that creep into oversight territory. I believe that given that it already has a review function, and the fact that this kind of amendment could infringe on some of the more serious cases we've seen in Canadian history with regard to things spanning decades but where investigations were ongoing. This argument could have been made by authorities in those cases, and I don't think it's at all appropriate. As I said, I would refer folks to the debate we had on Bill C-22 with the committee of parliamentarians where we heard evidence to that effect as well. I think where I have some issue with the new amendment is that it's in the agency's opinion. Obviously they are going to be, I guess, biased; it's a wrong choice of words. However, they are involved in an investigation. How are they going to know that investigation hinders or compromises an investigation that's going on with one of the security agencies unless that security agency is the one that gives them that information? It shouldn't be in the “opinion” of the review agency. If anything, it should be in the opinion of the national security agency that has an investigation that might be compromised. That's how I would interpret that, or how I think it makes better sense to me. I'll just boil it down to the main goal here, which is to make sure that the agency's activities don't conflict with the work being done by police. It is important to have that and this amendment would achieve that. But I can assure you we'll agree to disagree and we should probably put it to a vote. I will need explanations, as this seems contradictory to me. The review agency would have a mandate to oversee the operations of other agencies, but, through this amendment, it will be told to forget about its oversight so as not to harm operations. However, oversight is the agency's primary goal if it is doing its job properly. In order to harm an investigation under way, it would have to intervene. Of course, the review agency's work is not to intervene on the ground and harm an operation, but if its mandate to oversee other agencies is removed, it would be as if those agencies were left to do what they want. I don't understand this amendment's objective. Perhaps the officials could explain it to me. It seems to me that this is about taking away the agency's authority for unknown reasons. Please give me a concrete example. Excuse me, sir. The objective here is that the investigation would be suspended only in the context of complaints, so if an individual complains to the RCMP that he didn't like something, that investigation could be suspended if there is an ongoing criminal investigation at the same time to give pause to the complaint. There is no interference in the complaint process and the criminal investigation does not suspend review. Reviews could keep going on. The review body could keep doing its work. There's no provision to suspend a review. It is still unclear. The review agency is there to conduct an investigation in case of a complaint. Can you please give me a more concrete example? First, the Civilian Review and Complaints Commission, the CRCC, which is the existing body attached to the RCMP, is the one that was quite concerned that the language in their act, the RCMP Act, was imported over to Bill C-59. They're the ones who brought it up as very important. I'm not familiar with specific examples where this was used. It's probably more in the normal civilian complaints relative to normal police behaviour, but I thought it was important enough to include just in case there was a need. I agree with the intent of proposed section 27.1 of your amendment. I think it makes perfect sense. What I don't agree with is that the review agency determines whether they should stop it or not. From a non-national security perspective, I've seen this happen where, in the civilian police perspective, you might have a complaint made but the investigation of the complaint made against a member or members or a team is going to compromise an ongoing investigation, whether it be drug-related or some organized crime connection, so the heads of the agency will know enough about that and they will go to the investigative body and ask if it can suspend this until this is done because that investigation, its talking to people, will interfere with their investigation over here. I like this. It makes perfect sense. All I'm saying is that this has to be in this act but at the agency's discretion that is doing the investigation or doing the review. However we change the language, it has to mean in consultation with or on the advice of the agencies that are doing the criminal investigation. To me, it makes no sense that the review agency is the only one that makes that determination because they will only know the nuances of the investigation by the police on a criminal matter if they're told, and if they're told, then that should be in here. It should not be the agency's opinion that it's going to compromise. It has to be the opinion of the police organization that is doing the criminal investigation because the review agency is not going to have all the facts. It is not going to have all the nuances of that undercover op or whatever might be going on. They're not going to know it. They're only going to know the complaint aspect of it. I agree that this is language that we have to have. It just doesn't sit right with me that it's the agency's opinion because their opinion in this matter of whether it interferes shouldn't matter. It has to be the agency where the police of jurisdiction are being compromising. I wanted to build on the commentary by Mr. Motz. He used, a number of times, the word “interfere”. I wanted to direct my question to Mr. Davies and to look at the threshold that's actually in the language. The language isn't “interfere”. The language is “compromise or seriously hinder”. In my view, that's a higher threshold than simple interference. Any law enforcement agency is going to see some sort of intervention by NSIRA as an irritant or as interference. Interference itself isn't enough to stop it. It's “compromise or seriously hinder”, and I wanted to ask Mr. Davies about his view on that threshold and also on the agency's capacity to assess objectively whether that threshold has been reached. My understanding in the CRCC context is that it's well understood. It's a back and forth with the police agency and the CRCC. It's not a one-way decision. There's information exchanged and the threshold is met. If the police unilaterally had that ability to shut down complaints, that may cause a concern as well. If it's working well now under existing law, and it's clear that it is a discussion to get to that opinion, and obviously the police would have an incentive to ensure enough information was exchanged to help to get them to that opinion, if it were necessary, then that is the spirit in which it was drafted. Just a brief point, the wording for this is exactly the same as what's in the RCMP Act. This is the benefit of sitting beside the analyst. For a point of clarification, it's the same wording that we've used in other legislation. It's “if, in the Commission's opinion” and then “compromise or seriously hinder”. Mr. Chair, I would like us to take a short five-minute break, so that I can propose a subamendment in order to clarify the amendment's wording. I'm hesitant to grant any suspension only because we have about 10 minutes left and this is how far we've gone and this is how far we have to go. I'm a little hesitant to take time out. I'm prepared to let the debate carry on. Mr. Chair, let me remind you that we had the bill before the debates and that we should have worked on the details a bit more. I am in the committee's hands to ask for a suspension for several minutes. We'll put it in the form of a motion, but I just want a sense of the will of the committee. Was the purpose of the break just to rephrase the subamendment? Yes, we want to draft a subamendment. I would be flexible for two minutes. I'm just wondering if there is any way we could sit until 1:30. I know it's last minute. No? Okay. Can it be even less than five minutes, Mr. Chair? I can make it three minutes. We are suspended for 180 seconds. Colleagues, did the suspension of 180 seconds actually yield anything? Mr. Chair, I would propose the following subamendment. What we're adding there, precisely, is that there is a requirement to consult. Because this is not specific, you could have other law enforcement agencies outside the RCMP that this could impact. That's all to say that it's important there is a clear understanding that the review agency will consult, and that the decision to suspend still rests with it, but in consultation. Just so that we are precise here, I wrote down “in consultation with the lead organization”. Is that the subamendment? It's “with the relevant lead investigative organization”. We have to at least get the proper wording first for the subamendment that is properly before us. The debate is initially on the subamendment before we go back to the amendment, which Mr. Motz has properly placed before the committee. Debate is on the subamendment. We'll go to Mr. Davies first, and then ask members for their comments. I think the word “agencies” instead of “organizations” may be better. The only concern I have with that is the word “investigative”. It may be confused with investigations. This is about investigating complaints, as you see in the act. I want to be clear that we're talking about the investigative agency, meaning the law enforcement agency, in most cases. That's the only thing, when reading that, with which I have a concern. Before we ask for further comment, are you open to those wording changes, Mr. Motz? We may need a minute to talk about this. I'm getting chatter behind me. We'll leave the wording as such for the time being, and maybe come back to friendly amendments to the wording. I'm fine with the opinion of the official. I have a quick question about adding in this “consultation” wording. Does it create a duty to consult, when they're opening an investigation? I want to make sure we also understand what type of burden we're creating here. My understanding is that you're essentially codifying what is already going on, and already has gone on. In terms of meeting the threshold and understanding whether the threshold is met, you would have to consult the lead investigative agencies, to use your language, before you made your decision to suspend the complaint investigation. It would be limited to that. There would always be a lead investigative agency. Maybe one suggestion is to say “and in consultation with the agency leading such an investigation”. I will ask the same question, but in a different way. Would the fact that the agency has the option to consult the organization in question instead of being obligated to do so, while maintaining a procedure that already exists in case a consultation would not be held, really hurt the process? The agency may have its reasons for not doing the consultation. The reasons may be related to confidentiality or to its operations, regardless. The agency's decision not to do the consultation and be freed from that legal obligation does not interfere with its smooth operation. Again, we're talking about a complaint investigation. If you are undertaking the complaint investigation, why would you not want to find out more information and understand what the situation is before you suspended it? I can't imagine a situation where you would not want to do that before you made the decision to stop a complaint that you received. I see no further wish to debate, but we're still not clear on the wording itself. I would ask Mr. Davies and Ms. Beecher for your proposed wording, so that Mr. Motz can either agree that this is a friendly amendment, or not. The issue here is that we have a frequent use of the word “investigation”, referring to two types of investigations. We just need to be precise. Perhaps it would be, “if, in the agency's opinion”, as a start to the subamendment followed by “and in consultation with the agency leading the criminal investigation”. Then I refer to the committee to work out the exact reference between the two mentions of criminal investigation. Or “proceeding”, because we have to keep that same language in there, right? Right. I would accept that as a friendly amendment. Okay, but I want to be absolutely clear as to what we're voting on. Ms. Beecher, can you give that to the clerk so that Mr. Motz can read it? If he deems it to be a friendly amendment, then we'll be voting on Mr. Motz's amendment as amended by a friendly amendment. We're out of time here anyway, but I really don't like making amendments like this on the fly. I don't sense a lot of confidence from the officials that this wording is the right wording to have. Mr. Dubé brought forward amendments in which he said that it's standard practice, so we voted against your amendments because that's what the agency is already doing. I'm hearing that it's standard practice. My preference, I think, is to vote against the subamendment rather than trying to draft something quickly that's going to stay in legislation forever. I'm just not comfortable doing it like this. Given the time, I propose that our subamendment be reviewed and properly drafted and that we start with a clear proposal at the next meeting. We could adjourn the meeting on this note. I can seek a consensus around the table for that. It is after one o'clock; therefore, we are now adjourned. We'll see you back for another round on Thursday and then maybe after that again.